Refers to any period of treatment time where an appliance (such as removable plate, braces, functional appliance etc) is used to move your teeth into their new positions. Refers to the wearing of any appliance that holds your teeth in their new positions. Retention follows on from active treatment and generally consists of a removable plate for the upper teeth and a small wire (lingual bar) fixed to the inside of the lower front teeth with a bonding material which is tooth coloured. 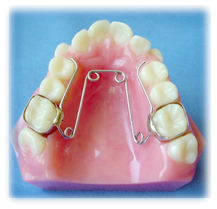 Traditional metal braces are the most common type of braces and are made of stainless steel. Stainless steel braces come in various different sizes, however today’s modern braces (that we use in our practice), are smaller, more attractive and more comfortable. These have the option of adding coloured elastics for a more colourful and distinctive smile. 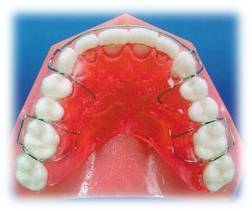 The elastics can be changed to a different colour at your regular treatment visit if you wish to. Clear braces being more fragile than traditional braces, as ceramic the material, is more prone to fracture and breakages. Greater care must be taken to avoid hard/sticky foods and activities, in order to avoid damage to the braces. Even though the brackets are white or translucent, there is still need of an archwire to go through all the teeth. The aesthetic is not completely clear, shown in the picture. Fixed Appliances in active treatment is to move teeth or reshape bone, by assisting orthodontic issues such as aligning the teeth, improve the bite or changing the shape of the jaws. It is fixed in the mouth and can only be removed by the orthodontist. They can be a range of appliances depending on the treatment goals. Removable appliances in active treatment is to also move teeth or reshape bone, by assisting orthodontic issues such as aligning the teeth, improve the bite or changing the shape of the jaws. However, it can be taken out from the mouth and worn depending on the orthodontists advisement. The treatment fee includes -impressions, plate (choice of colours, glitter or smiley faces, patient name etc) and all treatment visits which are usually every 4 weeks. (Does not include lost or broken appliances).